From the beginning, Oliver's voiceover was a lie. It was an unnecessary one, too. still stays the same). It has also been used over clips from the show, occasionally offering a look at what's happening currently. Since it comes from the main character, there's no reason not to trust what Oliver's saying in it, right? Shouldn't it all be true, even if there are some things he hasn't told other characters? Unfortunately, that's not the case. He didn't have to share with anyone that he wasn't always on the island. With some reworking and careful word choice, that issue could have been avoided. 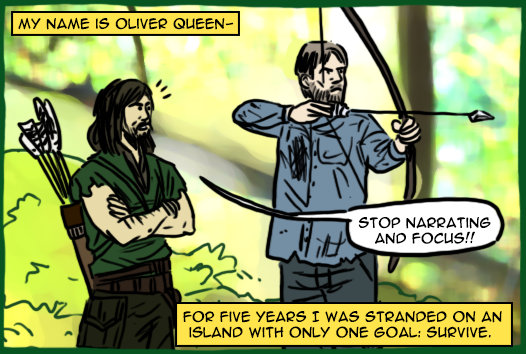 Oliver wasn't always on the island. He spent time in Hong Kong and Russia. Yes, he did return to the island (twice). Yes, his goal was always just to survive, no matter where he was. After six seasons, is the voiceover really necessary anymore? Perhaps it's a sign that it's not heard before every episode.